To date, clinical testing of AD04 has shown it to have a positive safety and tolerability profile with side effects similar to placebo. Our product candidate is intended to be easy to use since it is administered orally. The NIH reports that AUD is not the same for all people, but rather separated into profiles. Adial is addressing this finding with genetic segmentation. New research reveals five problem drinking 'profiles,' and shows that these types of drinking patterns are more prevalent at different ages. Adial is preparing to commence a Phase 3 clinical trial using AD04 for the potential treatment of AUD in subjects with certain target genotypes. 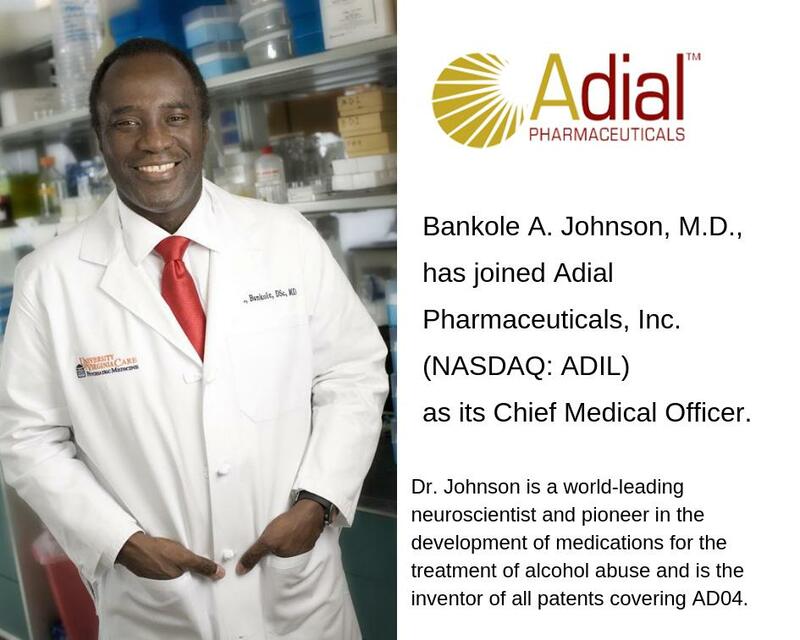 Adial has created an investigational attendant diagnostic biomarker blood test for the genetic screening of patients with certain biomarkers that, as reported in the American Journal of Psychiatry (Johnson, et. al. 2011 & 2013), Adial believes make patients more likely to benefit from treatment with AD04. Adial’s strategy is to integrate pre-treatment genetic screening into AD04’s label to create a patient-specific treatment in one integrated therapeutic offering. Adial’s goal is to develop a genetically targeted, effective and safe product candidate to treat AUD that does not require abstinence as part of the treatment.